Chef is a popular commercial and open source configuration automation solution. Many of our customer and users are leveraging Chef and JumpCloud. They often leverage Chef to configure and deploy their systems. They will then use JumpCloud to manage their centralized user management needs or said another way, their directory services. JumpCloud also has the ability to execute tasks across Windows, Mac, and Linux devices. Some of those tasks include securely managing users, executing security policies, and configuring systems, especially laptops and desktops. Some of our most active customers are also deep Chef users. To that end, JumpCloud has integrated its deployment to work with Chef. If you use Chef and would like to leverage it to distribute JumpCloud out to all of your servers, you can grab the Chef recipe inside of our product, or you can read more about it in our knowledgebase or right here! And that’s it! 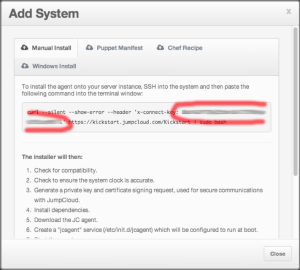 If you use Chef and want to automate user management tasks with JumpCloud, now you can quickly add us to your recipe. JumpCloud’s Directory-as-a-Service® is a centralized user management platform delivered from the cloud. It covers managing user access to systems, hosted LDAP, WiFi authentication, integration with Google Apps, multi-factor authentication, device management, True SSO™, and more. If you would like to dig in and give JumpCloud a try, your first 10 users are free forever.